Server Side Ad Insertion (SSAI) is one of the hottest topics in the industry right now and I’m tracking over 30 vendors in the market that say they offer some type of SSAI technology. To see what’s really going on in the market I conducted two surveys with over 400 broadcasters and publishers on their use of SSAI from both a business and technical level. 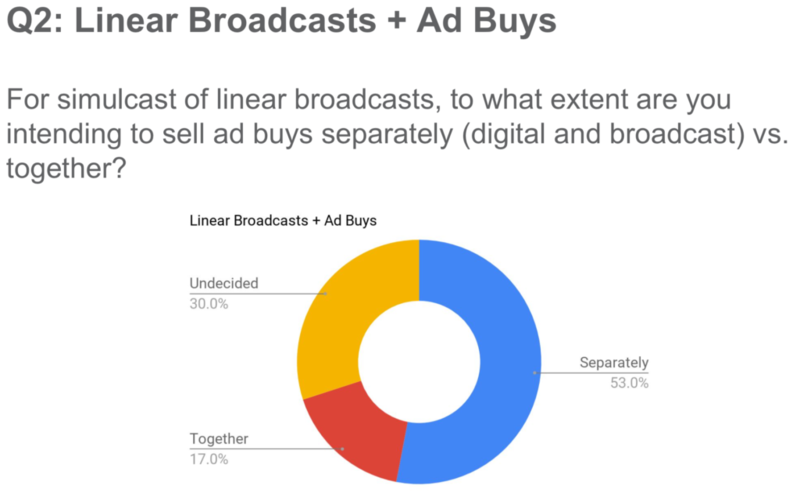 The survey collected data on how they do ad buys across digital/TV, what their DRM needs are, how their CPMs and fill rates in live compare to VOD, how important frame accuracy is, the metrics that matter most along with a host of technical questions. The results of the survey shed light on just how far SSAI still has to go to be considered a technology that broadcasters can rely on with performance and proper ad triggering. Lots of technical problems exists, especially getting SSAI platforms to work at true scale. I’ve include one slide with results from the survey but all of the raw data is available for purchasing. Please contact me for details.